Picard must prove Data is legally a sentient being with rights and freedoms under Federation law when transfer orders demand Data’s reassignment for study and disassembly. Riker’s performance was excellent. Data gave him a big hand. First Broadcast: 13th Feb 1989. Posted in Season 2, TNGTagged AI, Android, Cybernetics, Data, Picard, Rights, Riker, SentienceBookmark the permalink. Ah, at last! Been looking forward to this since it’s one of my fav episodes of all time. Regarding money and buying dinner, discussing money in star-trek is a path you just don’t wan to go down. The only conclusion you can reach is that the writers are confused or forgetful, because Star-Trek is really not internally consistent on this, sometimes there are clear systems of money and commerce implied, other times they deny the existence of money. There’s no way to try and rationalize this inconsistency other than just saying that the writers are forgetful. For the record, it was 800 (eight hundred) quadrillion bits. Also, I noticed another minor Riker Holler, when he says “ADMIRAL ON THE BRIDGE” as the admiral enters. Maddox looks to be about 35 in this episode, and says he evaluated Data at his entrance to Starfleet Academy. In ‘Redemption’, Data says he has 26 years in Starfleet– I think this episode occurs 2 or 3 years after the current one… plus Data’s 4 years in the Academy. For the sake of argument, let us say it occurred 4 years after ‘Measure of a Man’, therefore, Maddox inspected Data 26 years ago… or when Maddox was about 9 or 10 years old. On the Data vs Moriarty situations: the issue with Data here isn’t that Picard et al. won’t allow Data to be destroyed. It’s that Maddox claims Data doesn’t have the right to choose. 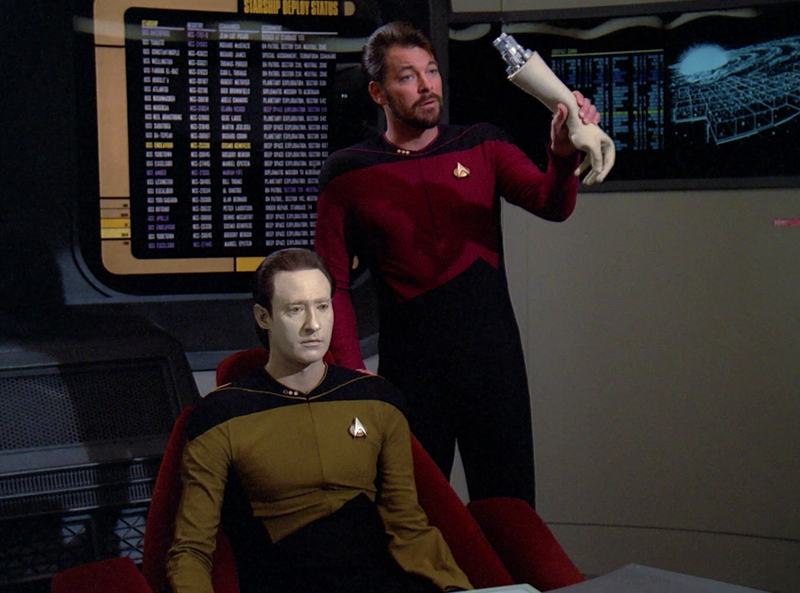 If Data had chosen to go with Maddox and be disassembled, Picard and Riker and everyone else would have wished him well, even if they disagreed. When Moriarty was threatening the ship, Picard explained the situation to Moriarty and Moriarty chose to give up computer control. Moriarty allowed himself to be turned off, at least temporarily. I don’t think there’s a contradiction. It’s worthwhile watching the HD extended version of the episode just for the additional fencing scene: it makes the setting up of the battle between Riker and Picard a bit more explicit. Oh, and the scene between Data and Geordi is good too. Just a bit of trivia. In episode 16 season 2, ensign Gomez orders a hot chocolate from a replicator in engineering and thanks it. This of course spurs a conversation with Geordie about treating the computer with politeness. The EU referendum campaign reminds me of this episode: two colleagues, forced to take separate sides of the argument and both must make convincing cases, only this time, Riker won!